Josh Mitteldorf and Dorion Sagan‘s joint venture, Cracking the Aging Code, formally launched in June of this year. 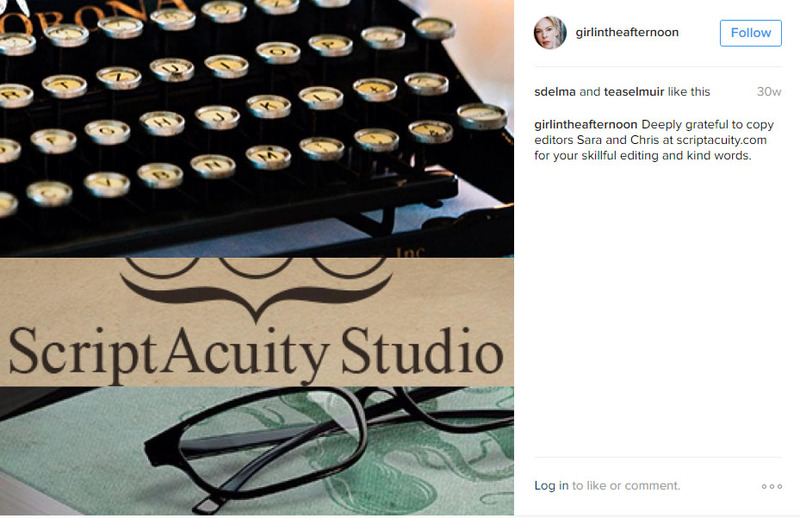 Similarly, author Serena Burdick’s debut novel, Girl in the Afternoon, officially launched in July. Dr. Mitteldorf and Mr. Sagan and Ms. Burdick were kind and thoughtful enough to acknowledge us in their books—and Ms. Burdick also tweeted her appreciation—for which we are truly very grateful. 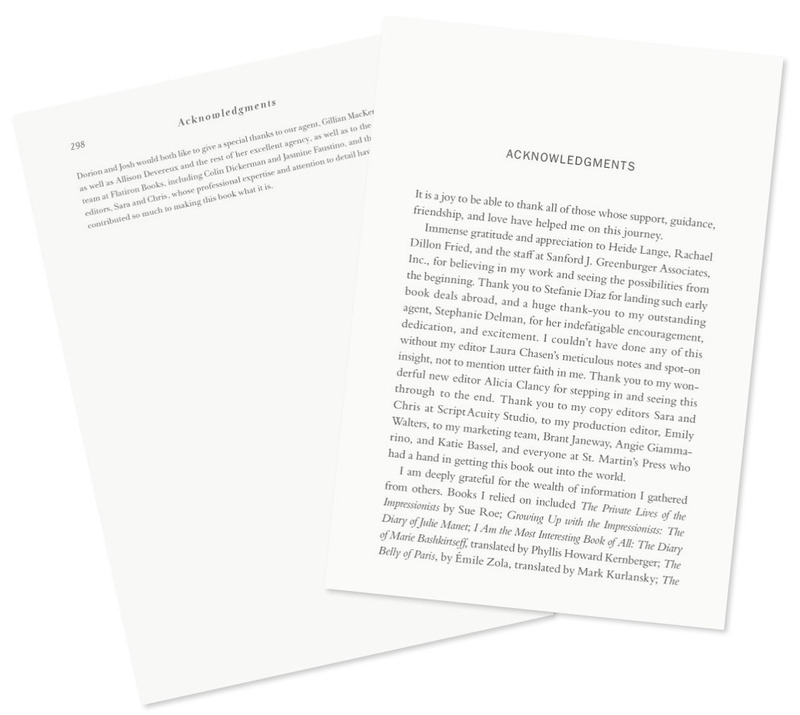 Look closely at these two different pages of acknowledgments (see above). There we are! Whee! Such acknowledgment—in our case, it has happened only a handful of times over the years—is a rare treat for most editors. There are so many people involved in a book’s publication that it would be hopelessly impractical for authors to personally thank every single person for his or her involvement in the project (and that’s assuming the author even knew of everyone or even wanted to!). There is the author, of course, and anyone with whom the author speaks about the manuscript—formally or informally—to discuss and solidify ideas, solicit feedback, read drafts … and the myriad of other ways authors’ friends, associates, and coaches assist with the creation and smoothing of a manuscript. Let’s not forget about anyone with whom the author interacts for research purposes in the course of writing and refining the manuscript and those from whom third-party permissions must be sought and obtained. Such processes alone can take years, and there are always unsung heroes involved. Then, often, there are such players as literary agents and independent marketing professionals who assist with garnering interest in the manuscript. Once the book is picked up by a publishing house—and let’s remember that there are contracts directors involved with the various legalities of the deal—there are seemingly countless professionals whose job it is to facilitate the process. Just among editors alone, there are a variety of types, all of whom have distinct (yet often overlapping) roles. Acquisitions editors, managing editors, developmental editors, copyeditors … they all play roles in the process. Who designs the cover art? Who writes the jacket copy? Who on the publisher’s legal team reviews the content? Who indexes the manuscript if required? Who screens the revisions? Who typesets the book after its copyedit? Who proofreads the final proof before publication? What about the marketing and promotion team? Those involved in communicating and monitoring the production schedule? And the people who read advanced readers’ copies to provide feedback? What about the innumerable folks in various ostensibly unrelated-yet-still-mission-critical positions—administrative assistants, accounting professionals, interns charged with a variety of responsibilities? How many countless people work hard to manufacture and distribute that glorious hard copy that you lovingly hold in your hands? And if the book is self-published, there are often entirely different processes and people to shepherd those processes along! It is little surprise, then, that copyeditors’ names only very occasionally make it into the printed glory of the manuscript on which they so dedicatedly worked—check out the acknowledgments of the books you read and see for yourself—which is part of what makes receiving one such a distinct honor and privilege.